May is Healthy Vision Month and provides a chance to educate your community about the health consequences of smoking on vision. You can use this new infographic and messaging in your social media efforts, tweets and posts. 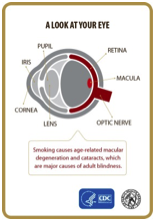 A new Surgeon General's Report finding: Smoking is now known to cause age-related macular degeneration (AMD). Age-related macular degeneration, or AMD, is an eye disease that causes loss of vision in the center of the field of vision. It is the leading cause of vision loss in people over age 65. Smoking also causes cataracts, and both diseases are major causes of blindness. The CDC's Healthy Vision Initiative is also a great resource. This initiative is designed to promote vision health and quality of life for all populations, throughout all life stages, by preventing and controlling eye disease, eye injury and vision loss resulting in disability.